A group of World War I and II veterans who are interested in the problems and entertainment of all veterans have formulated a plan to organize a club to be known as Ex-Service Men's Club, which shall provide equal privilages to all veterans, regardless of when or where they may have served. A mass meeting is to be held Wednesday evening, February 20, at 7:30 in Building 1402, for the purpose of organization and familiarization with the tentative plans made thus far. All veterans at BHOD are urged to attend, bringing with them ideas and suggestions to make this a successful club. Talk it over with your veteran friends and urge them to attend also. This is to be your club, a place in which to relax and enjoy yourself, a place to explode in G.I. talk where you will be understood but not heard. The next general meeting of the Depot veterans is to be held Wednesday evening, March 6, at 7:30 p.m. in Room 3 of the Community Building. The purpose of this meeting is to elect and install permanent officers for the Ex-Servicemen's Club, as well as to establish by-laws to govern its activities. This meeting is to be held at the request of 155 veterans who attended a mass meeting held February 20 at which it was decided that an Ex-Servicemen's Club should be formed for purposes of recreation and enjoyment of all BHOD veterans. What is believed to be the largest independent organization of veterans in the state was accomplished at the Black Hills Ordnance Depot, Igloo, S. D. on Wednesday, March 5th, when the veterans of that installation formed the Igloo Veterans Club. A Constitution and by laws were adopted, and election of officers held, resulting as follows: President, Leonard Jennewein; Secretary, Riley C. Connelly; Board members, other than the forgoing, Jack Lanter, Stanley Barnett, and Harry Strouse. The purpose of this organization are to promote social, recreational and civic activities and to engage in such other activities as may be of importance to veterans and may contribute to their betterment. The Igloo Veterans Club is offering a first prize of $5, with two honorable mentions for the best design for an insignia for the Veterans Club. The design should relate to World Wars I and II, since the Club is open to all veterans on the Depot. (Julia E. Brigham won the insignia contest sponsored by the Vets Club for an insignia for the club.) From the Walrus; April 4, 1952; page 2; Memories; 6 Years Ago. A drill demonstration by a picked squad of men from the Igloo Veterans Club, which is the largest independent Veterans Club in the State. One member of this drill squad was on a drill team that performed before the King and Queen of England. The highlight of the day will be the dedication of the Igloo Veterans Club. New clubhouse of the Igloo Veterans Club, which will be presented to them on Army Day and which consists of the front half of the north wing of the Mess Hall. South half of it will be a lounge and the north half will have a pool table, card tables, ping pong table, etc. It is open to all veterans but only veterans. Vets Club holds guest night. The new club room has one side occupied by chairs, lounges and other furniture, and the opposite side by pool and card tables. 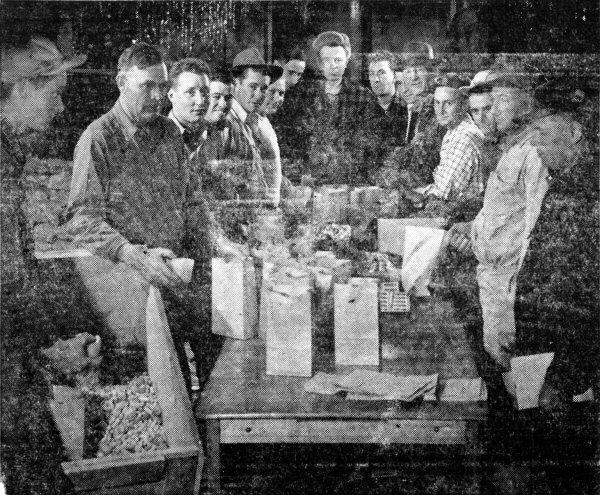 Although a large supply of beer had been ordered, it was exhausted by 10:30.
played host to our younger generation by handing out 1000 to 1100 candy sacks at Christmas time. George Cottrell, Peter Knoepfle, unindentified, John Eric and Matt Balander). On March 8, 1952, the Igloo Veterans' Club will have completed its sixth year in existence at Igloo. Many at Igloo who attended that first official meeting in 1946 will remember that Leonard Jennewein was elected the first President; Riley C. Connelly, secretary-treasurer; and Stanley Barnett, Harry Strause and Jack Lanter, the members of the first Board of Directors. The many eventful years that have followed have made the Vet's Club an essential part of the Igloo community. The Vet's Club has become a center of social activities as well as a staunch supporter of various welfare drives, athletic contests and community betterment. The Vets' Club moved into its present location on Army Day, April 6, 1946, with ceremonies featuring Col. Samuel M. Fletcher, then Commanding Officer of BHOD, as guest speaker. Since that time the "Club" has been the scene of dances, bingo parties, and the Saturday night rendezvous for Igloo veterans and their guests. The first Manager of the Club was Carl Hartman. He was succeeded in 1948 by Heldon McCrowsky, who held that postion for one month, to be succeeded by Arthur Wagner, the present manager. The orderly manner in which the Club's activites are handled is a distinct compliment to Art Wagner's managing ability. Whenever persons at Igloo have been shaken by an emergency or deprived by death or disaster the Vets' Club has come forward with an open pocketbook. Over $3,600.00 has gone to such deserving causes. Organized charities as the March of Dimes, the Cancer Fund, and the Crippled Children's Fund have received substantial support from the Vet's Club. The sponsorship of athletic events and contests has been another primary activity of the Igloo Vets' Club. Considerable sums have been spent obtaining athletic equipment to outfit local teams to represent them in contests with local organization, and to engage worthy opposing teams for sporting events at Igloo and away. These contests have done much to develop and improve the community spirit of Igloo and have provided excellant entertainment as well as an outlet for outstanding athletic talent. The last year has been a full year for the Vets' Club and under the able direction of Lester Rubey, President, it has managed to contribute heavily to local charities and to maintain its program of public welfare despite the loss of a major means of income. In the past the Club has had able leaders, among them and succeeding Leonard Jennewein in 1947, Dore Newlin; in 1948 William Bennett; in 1949, Henry Stone; and in 1950 and 1951, Lester Rubey. Past and present Board Members since 1947 are: Stanley Barnett, William Bennett, John Sweeney, Ralph Cappola, Dore Newlin, Larry Roehl, Bruce Davis, Jim Rayford, Ralph Griffin, Bernard Boltz, James Librcajt, Frank Martinez, Robert Jess, James L. Jones, Walter Flammond, Harold Kimblom, Blaine Cuckler, Einar Skram, James Resseguie, Henry Stone and Frank Burke. Resseguie, Melville Cox, Frank Burke. The Igloo Vets Club was first organized in March, 1946, with the official opening held April 6th, 1946. The purpose of the club was to provide a place where all veterans of Igloo could have a place to spend their spare time, and the results during the intervening years have proven the worth of the club. It has become a center of social activities, and a staunch supporter of various welfare drives, athletic contests and community betterment. Probably the most notable contribution of the Vets Club to the Igloo community has been the interest the club has show in athletic and other activities, and in their worthy contributions to the needy and those who have been shaken by an emergency or deprived by death or disaster. Too much credit cannot be given to all those men, who, in an official capacity, or on an appointed committee, have given their best services unsparingly, for the betterment of the club in its six years of existance. The club, in addition to its activities in local assistance, has been very generous in their donations to outside funds such as Polio, Crippled Children and so on.